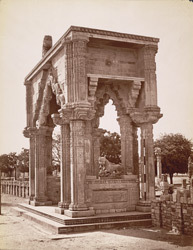 Photograph of the gateway of the Teli ka Mandir at Gwalior in Madhya Pradesh, taken by Deen Dayal in the 1880s, from the Bellew Collection: Architectural views in India. The town of Gwalior in central India is the site of a magnificent fort, perched on a rocky plateau, which changed hands several times over the centuries. The Teli-ka-Mandir or Oil-pressers temple was probably built in the middle of the eighth century and is the oldest surviving monument in Gwalior Fort. This photograph shows the richly carved torana archway that leads to the Teli ka Mandir. The temple presents a unique blending of various Indian architectural styles. The rectangular sanctuary is covered by a masonry tower of the Nagari or North Indian type crowned with a Valabhi or barrel vaulted roof with a gavaksha, an arched window. The niches on the outer walls, which no longer house the sculptures, are covered by arch-like motifs, a North Indian type of decoration. The doorway is decorated with carved figures of river goddesses, amorous couples, foliation motifs and a flying Garuda on the lintel. The temple, which possibly was originally dedicated to an aspect of the Mother Goddess, was reconstructed in 1881-83.